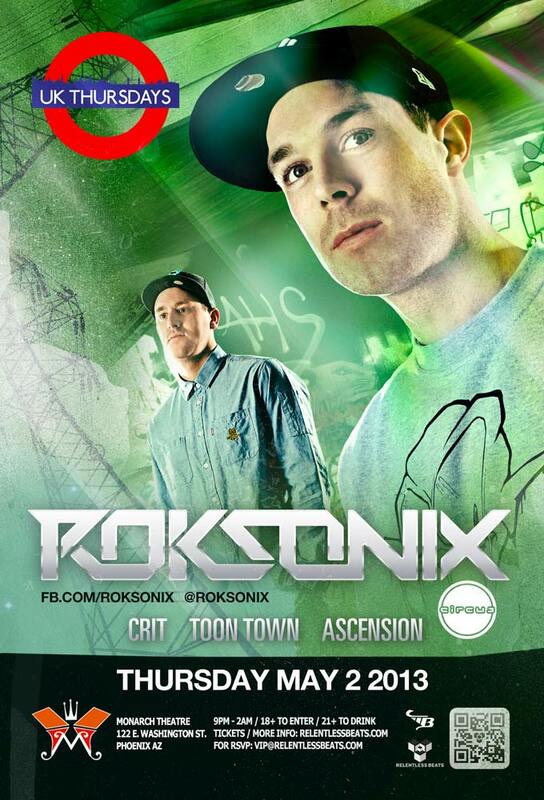 Relentless Beats and UK Thursdays present ROKSONIX at Monarch Theatre in Downtown Phoenix on Thursday, May 2, 2013. Experience BASS on 30,000 watts of PK Sound! This is an 18+ show. Guy and Phil were both surrounded by music from a young age, growing up and playing in bands together during their early teens. Interested in hip hop and jungle they started attending events like Slammin’ Vinyl and Helter Skelter at the Sanctuary in Milton Keynes. With new influential drum and bass DJs emerging, like Andy C and Mampi Swift, the guys knew they wanted to be involved in the rave scene, and both became vinyl junkies, mixing drum and bass every spare second they had. Next the boys began creating their own music, experimenting with different genres but with a focus on drum and bass. After Guy heard Giant’s ‘Drumsticks’ and Phil was introduced to Caspa and Rusko’s ‘FabricLive 37’, they were inspired to make new sounds, and with their shared history, it wasn’t long before they were collaborating together on dubstep tracks, and decided to form Roksonix. Their first dubstep track, a bootleg remix of ‘Hide and Seek’ by Imogen Heap, was an instant internet sensation, gaining over 4 million hits on YouTube in less than 10 months. The boys followed this up by entering and winning the Circus Records remix competition of Flux Pavilion’s track ‘Voscillate’, with subsequent remixes of ‘Follow’ for Crystal Fighters and of ‘Sergeant Smash’ for Talay Riley. The boys were also asked to produce the official remix of Labyrinth’s debut single ‘Let The Sunshine’ for Sony Records. Roksonix also stirred up a small storm in the dubstep world with a number of original tracks including ‘Just Jokes’ released on Prime Audio, and ‘Skank Tank’, soon followed by a remix of FuntCase’s ‘Gorilla Flex’ and collaboration with Statelapse, ‘Let’s Go’, all on 4:20 Records. In their first whirlwind year Guy and Phil also began DJing out at events, initially within the UK, then outside of the UK to become truly international artists. After only a year of producing original tracks and remixes, DJing and winning the Circus remix competition the boys signed exclusively to Circus, so watch this space for further original tracks, remixes and tour dates from the Roksonix boys. Tickets are currently $10. Purchase your tickets HERE.